The Gish Bar Times: S2O, polysulfuroxide and sulfur polymer on Io’s surface? S2O, polysulfuroxide and sulfur polymer on Io’s surface? The other Io-related paper in the April 2008 issue of the journal Icarus is titled, "S2O, polysulfuroxide and sulfur polymer on Io’s surface?" and is written by Donia Baklouti, Bernard Schmitt, and Olivier Brissaud. 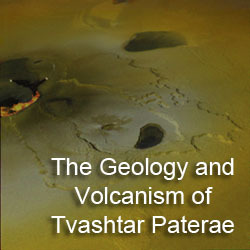 Such research is important as the presence of condensed S2O is one explanation for the reddish deposits near some volcanoes. In this paper, the authors performed laboratory experiments on S2O, a compound predicted to be among the gases expelled by volcanoes on Io but to date not observed. The authors synthesized the compound from gaseous SOCl2, then allowed the product to condense on a target in temperature and pressure conditions expected on Io. This experiment was preformed several times, with different temperature conditions applied to the sample, and with some having pure S2O in the initial gas and others with 2-10% S2O in a matrix of SO2, to match the expected gas composition at Io's volcanic vents. At various times, the authors then measured the visible and infrared spectra of the sample plate and compared their results to Galileo NIMS data of Io's surface. In both gas samples, much of the S2O disproportionated into sulfur and SO2 before condensing on the sample plate. When the sample plate was at a temperature below 120K, the resulting condensation was often a mixture of SO2, sulfur, and a small amount of S2O. Above that temperature, SO2 can not condense or sublimates when the sample plate is heated above that temperature, leaving behind the sulfur and S2O. However, the S2O does not stick around for long as it polymerizes, forming longer chains of polysulfuroxides until the molecules lose more and more of their oxygen and yellow sulfur polymers are formed as the temperature is raised more. These results suggest that on Ionian surfaces below 120K, the appearance of S2O would be masked by the presence of SO2, forming whitish deposits, and sulfur polymers, while above that temperature S2O is converted into yellowish polysulfuroxides. These results further suggest that S2O can not explain the reddish deposits seen at some volcanoes. This further supports the idea that these deposits are formed from the condensation of S3 and S4 that is directly vented from Io's interior. 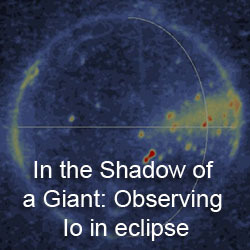 The authors compared their visible and infrared spectra measurements to Galileo NIMS spectra of Io. The authors found that many S2O absorption bands either occur on the wings of strong SO2 bands, which dominate Io's infrared spectrum, or are too shallow or would occur over too small a surface area to be observed by NIMS. The NIMS spectra is better explained by a combination of SO2, stable S8, and sulfur polymers. I am the author of this article. First of all, thank you for your interest and for your very good summary of my article. I just have a small correction for your last sentence. The Voyager visible spectrum is better explained by a combination of SO2, S8 sulfur and sulfur polymer. NIMS spectra are Near Infrared spectra, and sulfur (S8 and polymer) has no signature in this wavelength range. 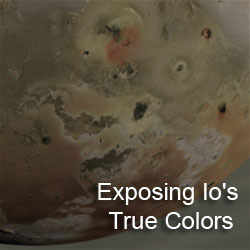 Then, I don't think that S3 and S4 could explain the red deposits of Io. These molecules have a high tendency to polymerize (this is well known by chemists) and I am quite sure that after deposition, they will react exactly as S2O does. However, of course, only experiments can confirm this assertion.